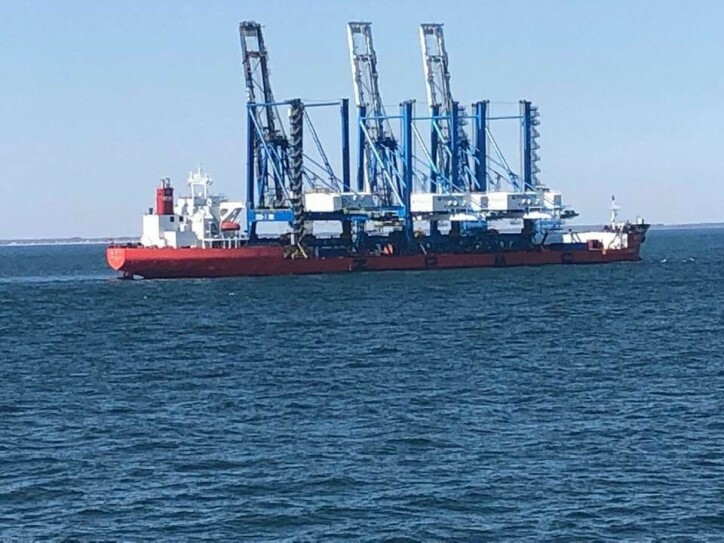 At approximately 11:55 p.m. on Tuesday, March 26, the ZHEN HUA 25, a heavy lift vessel transporting two (2) new ship-to-shore (STS) cranes bound for Philadelphia, PA., will be navigating beneath the spans of the Delaware Memorial Bridge. As a precaution and to eliminate driver distraction, the Delaware Memorial Bridge, both northbound and southbound, will be temporarily closed to all traffic for a period of approximately 30 minutes while the ship travels north to Philadelphia. This temporary closure may take place sometime between 11:45 p.m. and 12:15 a.m. Tuesday night. Traffic delays are expected and motorists should plan accordingly. The distance from the water level to the top of the cranes aboard the ZHEN HUA25 is 188 feet, 3 inches. Due to tides levels and the Delaware Memorial Bridge’s measured clearances, the vessel must travel under the spans during the period of low tide. Both spans of the Delaware Memorial Bridge will reopen to traffic once the ZHEN HUA 25 clears the structures. Produced by Shanghai Zhenhua Heavy Industry Co in China, the two new super-post-Panamax cranes are destined for PhilaPort’s Packer Avenue Marine Terminal. Please note that a third crane aboard the ZHEN HUA 25 is destined for Wilmington, N.C. Once the two (2) new ship-to-shore cranes are off-loaded in Philadelphia, the ZHEN HUA 25 – with the remaining crane aboard the vessel – will make its way south on the Delaware River. Delaware Memorial Bridge traffic will once again be temporarily interrupted for this passage, which is tentatively scheduled for Tuesday, April 2 at approximately 5:15 a.m. A second motorist alert will be issued when the schedule is finalized. The DRBA, a bi-state governmental agency created by Compact in 1962, owns and operates the Delaware Memorial Bridge, the Cape May- Lewes Ferry, and the Forts Ferry Crossing. The DRBA also manages corporate and aviation properties through its economic development powers - two airports in New Jersey (Millville Airport and Cape May Airport) and three in Delaware (New Castle Airport, Civil Air Terminal and Delaware Airpark). All DRBA operating revenues are generated through the bridge, ferry and airport facilities.